Fest Info: AAHVAN in sanskrit means an invitation. It’s a call for students to showcase their technical and managerial excellence. 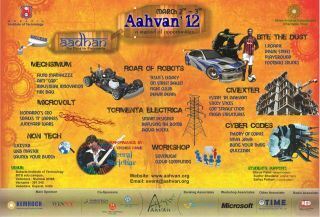 The pioneering batch of BIT sowed the seeds of AAHVAN and growing from national to international level tech-fest, we are now organizing AAHVAN’12. AAHVAN is a foundation for budding engineers to imagine, invent and innovate along with exploring the vast myriad of opportunities that AAHVAN brings to them. The myriad Aahvan, by sanskrit literature, means “welcome”. The idea is to invite the budding technicians of Gen-X to explore “A myriad of opportunities”. Initiated with the stellar purpose of extracting quality engineers with high potential and enhancing the creativity of the youth, Aahvan is the congregation of the students across the nation gathered to dis! cover hitherto, unexplored realms of engineering techfest….